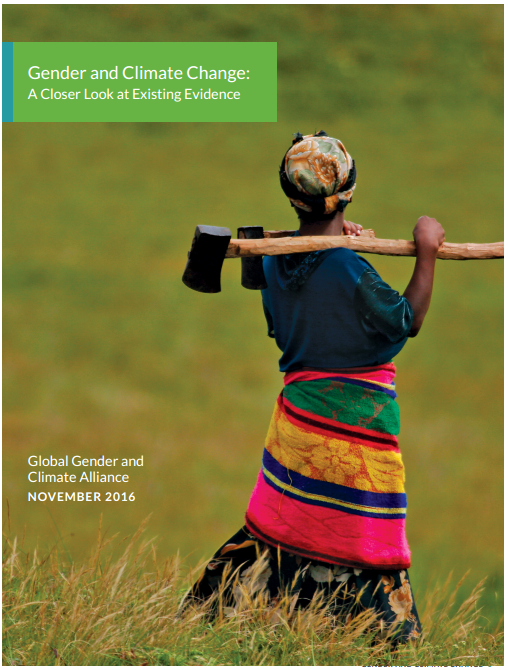 The GGCA is proud to announce a new research piece, “Gender and Climate Change: A Closer Look at Existing Evidence”. Perceiving a gap in the resources available to individuals and organizations concerned about the gendered experiences of climate change, GGCA commissioned this literature review in early 2016 in order to provide the most up-to-date assessment of the current evidence base illustrating how vulnerability to climate change and climate adaptation decisions vary by gender. This is designed to serve as a resource highlighting literature addressing a broad array of gender and climate issues affecting vulnerability and adaptation capacity. While this document contains hundreds of references, due to space limitations, it is not able to provide a comprehensive assessment of every topic covered. Readers are directed to the literature reviews cited below for additional sources, as well as subject-specific references that are contained in many sections of the review, which often contain information on additional research.